The story says that, back in 1916, a driver lost control of his Ford Model T, plunging it into Chickamauga Creek in Chattanooga. Local service station owner Ernest Holmes Sr. heard about the accident and, along with nine other men, spent the next eight hours working to recover the car. Understandably thinking there had to be a better way, he then enlisted the help of two friends – L.C. Decker and Elmer Gross – and together the team set about building a wrecker. As with many inventions, the first attempt proved less than successful. An improved design – which included outriggers to stabilize the vehicle the wrecker was attached to – succeeded. Now, besides providing his garage service to anyone who drove up, Holmes could go out and help people when and where they needed him. 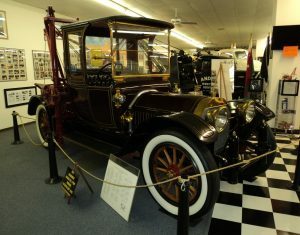 These stories and more about the towing industry and the Holmes family are displayed at the International Towing & Recovery Hall of Fame & Museum, located appropriately in Chattanooga. Understanding an industry is more than equipment and more than a function, the museum also focuses on the heart of the industry – its drivers. In the museum’s Hall of Fame almost 300 men and women are recognized for, among other things, more than 20 years in the industry and for being ‘outstanding’ people. A more sobering marker, and one that drives home the risks involved in the industry, is the Wall of the Fallen memorial, honoring those killed in the line of duty. It is said most people don’t think about tow trucks, until they are in trouble. As the industry achieves 100 years of service to the nation, perhaps it is time to consider its history and the people who have made it. American Eagle Towing is proud to support the International Towing & Recovery Hall of Fame and Museum, as well as the Wall of the Fallen.